On Your Mark, Get Set, Let’s Jog! 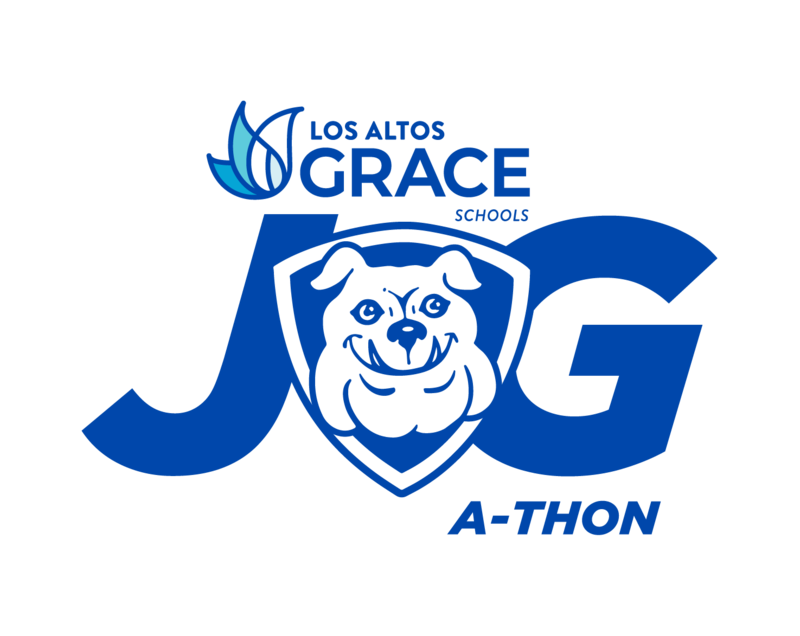 Our annual Jog-A-Thon will be held on Friday, October 26th. This is our school’s main fundraiser. All families are encouraged to join the day, cheering for your students as they run. The money you raise goes directly to enriching educational opportunities for our students and staff (such as traveling science programs, field trips, and teacher enrichment seminars), classroom activities, after school robotics, second language acquisition and technology upgrades. Each student will walk, run or jog for 45 minutes to run laps around a 125-yard track, on the school playground. All students are invited to participate. How do I get donations? Ask your friends, family, and neighbors. Do a job for someone in exchange for a pledge. Company matching funds. Have a bake sale in your neighborhood. Have a car wash.
$100 Club: For any student who raises $100+ in donations gets to be part of a Bounce House Party! $200 Club: For any student who raises $200+: choose a prize from the Treasure Chest AND get entered into a drawing for 2 Disneyland tickets! $300 Club: For any student who raises $300+: GetAir Trampoline Party & Pizza Lunch! Top Earner: For the student who raises the most money in donations, he/she will receive 4 Disneyland Tickets! Jogging clothes should be worn to school, no changing please. Please be sure your child wears tennis shoes and appropriate jogging clothes. There will be no time to change. They may stop and rest at any time. Water will be available at all times. All joggers will get a Gatorade drink after they jog. We have lots of fun planned for the day – be sure to check out the schedule so you don’t miss out on anything! Please note – school begins at its regular time, 8:30am and will be dismissed following the awards assembly at 1:50pm. We have a fun day planned with the jog in the morning, Deli News Pizza lunch, and capping off our day with an awards assembly. Family and friends are invited to join us for the day. We need YOU! It takes many volunteers to make the jog-a-thon run smoothly and be a success for our students, their families and our school. Volunteers are needed, on the day of the jog-a-thon, to help with set up, count laps, the water station and clean up. Volunteers are will also be needed to help with the bounce house party and to drive students to the $300 party. All money collected is due by Friday, November 2, and donations are TAX DEDUCTIBLE. Turning in Donations: Money that is collected can be turned into the office anytime from Monday, October 8 through Friday, November 2. All donations MUST include the student’s name each time money submitted. All money must be received by November 2 to be eligible to count towards the awards and parties. Pledge Per Lap: Following the jog-a-thon, a “Student Lap Count” sheet will go home with your student. Please share this information with anyone who has given a “pledge per lap”. Students who have “per lap” pledges should collect the money at that time. Company Matching Funds: Many companies match funds raised for nonprofit organizations. This can double what your student raises – don’t forget to check! We can help by providing the necessary information to your company/corporation. Contact the office for help. Checks should be made out to Los Altos Grace PSG. Awards Assembly – There will be an awards assembly, in the chapel, from 1:30-1:50pm. We’ll have a video of pictures from the day and give all the awards and medals. Family members and friends are welcome to join. Every student (K – 6th Grade) who raises $100 or more in donations will be part of the $100 Club and able to participate in a huge bounce house party with multiple bounce houses. $200 Club: For any student who raises $200+ in donations will choose a prize from the Treasure Chest AND get entered into a drawing for 2 Disneyland tickets! $300 Club*: Every student (K – 6th Grade) who raises at least $300 will enjoy an additional school day activity: a GetAir Trampoline Party and Pizza Lunch! *Eligibility is based on actual money collected and turned in by November 2.